It's my neighbor's birthday and I wanted to make her a special card. 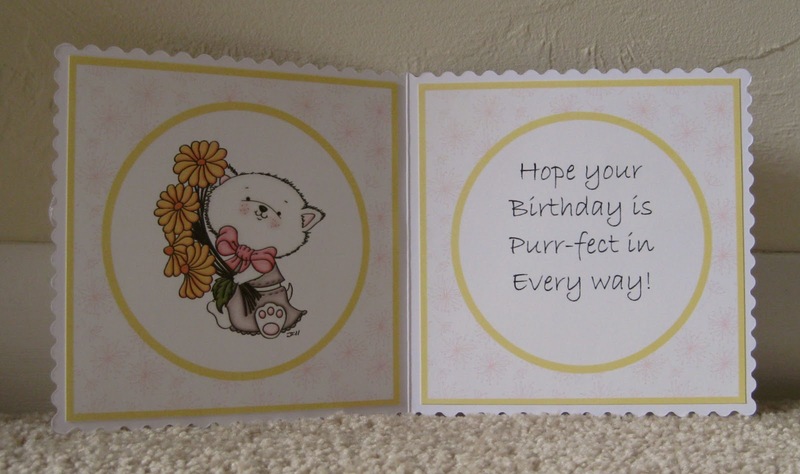 She just got a new kitty and her favorite color is golden yellow, so I thought this ultimate kit from Paper Creator called Daisy Kitten would be "purrfect" for her card. For the front panel, I used patterned papers from the kit and the kitty image, then created the inside panels using Silhouette Studio and typed the saying. Added a ribbon, tag and some bling. Scalloped card base is by Docrafts Papermania. Corners were cut out with Spellbinders Lace Heart die. Sorry about the lighting on the photos. It's been cloudy and dark here all day and my camera's flash and I don't get along very well. This is adorable! So very sweet! Thanks so much for playing along with us over on the Simon Says Stamp Wednesday Challenge Blog! Oh my word, so totally cute... love that kitty! 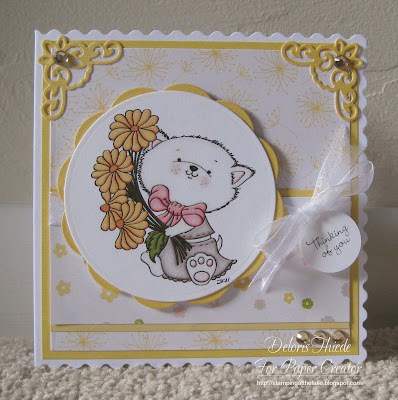 A beautiful card for your neighbour Deloris, such a cute image. This is precious, Deloris. I'm sure your neighbor will love this. Thanks for sharing with the Birthday Card Challenge at Eureka Stamps this week! Your card is beautiful! I love the sweet image and all of the layers. Thank you for playing along with us at Craft Your Passion. We hope to see you again! Your neighbor will love this precious card. I hope the kitten will love Doodlin. Surgery over. Drugs and some pain but look forward to my crafting future. Thanks for all you posts which make me smile. Hi Deloris, I just popped back to say thank you for joining us at Di's Digi Designs. Lovely card. Your cat is so cute! Thank you very much for joining our challenge at Come and Get IT. This is so cute! Love the colours. Thank you so much for joining us at the Simon Says Stamp Monday Challenge in our first challenge of the year. Happy New Year!